American citizen Jared Tucker was among at least 13 people killed in Thursday's vehicle-ramming attack in Barcelona, his family has confirmed. Tucker's wife, 40-year-old Heidi Tucker, told ABC News that the couple had been celebrating their first anniversary. They started in Paris, moved to Venice and were finishing up the trip in Barcelona, she said. After meeting a friend, the three were making their way through the city's famous Las Ramblas boulevard to walk on the beach when they decided to stop for sangria and to buy souvenirs, she said. About a minute after Tucker excused himself to go to the bathroom, "mayhem broke out," she said. People were screaming, running and crying as the sounds of sirens from first respodender vehicles filled the air. In the chaos, Heidi Tucker got pushed "farther and farther away" from where she had last seen her husband, she said. Roads were blocked off, making it difficult to look for him. "So we looked to try to get back to the main road for I don’t know, I’d say about an hour and that was just wasn’t going to happen," she told ABC News. "I’m looking for Jared everywhere and I can’t find him." Heidi Tucker said it "didn't really cross" her mind that her husband could be injured. His name wasn't on any lists in the makeshift emergency area, but a friend had shown her a photo on Twitter that "she was pretty certain" was him. "He looked pretty injured, but she couldn’t really tell," she said. "And I ended up seeing the picture [later] and it was definitely him. But it appears he had somebody tending to him, so that made me a little bit hopeful that he was alive." It wasn't until late Friday night that she was able to see her husband's body. He has not yet been positively identified because Spain has a "very extensive process of doing that," she said. Heidi Tucker said her husband had a "magnetic personality," and that he would cook her dinner every night. "I don’t want to do this life independently. I want to do it with him," she told ABC News. "I think we were soul mates. He loved me inside and out for every nice thing about me and for every horrible thing about me. And I just don’t think you find that every day." Tucker's father, in an emotional interview with ABC News, explained how the family learned of his son’s death. Dan Tucker said his family saw a video of a person lying on the ground after the attack who was wearing a blue shirt and tan pants, and Heidi told them that's what Jared was wearing at the time. "There was a person kneeling beside him and so we thought, 'That's a good sign. He's probably hurt but not seriously injured,'" he told ABC News, with tears in his eyes. "But ... it became more and more obvious that Jared couldn't be found." The grieving father told ABC News he and his son were "really close," and their family is struggling to make sense of the tragedy. "It's been hard, it's been bitter. But I don't know what my feelings are," Dan Tucker said." I'm not angry so much, I just don't understand it. And my wife's in shock; it's a lot harder for her." Dan Tucker said he and his wife are grateful to be surrounded by family, friends and members of their church who are helping them get through this difficult time. "I don't know how people handle something like this when they don't have a support group," he told ABC News. "We've got a huge support group and it's been really nice to have that." On Friday, U.S. Secretary of State Rex Tillerson confirmed that the Department of State had "received word and confirmed the death of one American citizen in the terrorist attack in Spain." U.S. officials are "still confirming the injuries and deaths of others," he added. "Hate is not an American value," Tillerson told reporters. Five alleged terrorists were killed in a shootout with police in Spain's Catalonia region early Friday following the deadly attacks, which included a separate incident in Cambrils where pedestrians and police were struck with an Audi A3 vehicle. Catalan police said the alleged terrorists, who wore fake suicide vests and were armed with knives, were killed in the coastal town of Cambrils. Catalan police official Josep Lluis Trapero said at a press conference Friday that investigators still have not conclusively identified the driver in the Barcelona attack, who was at large after fleeing on foot. 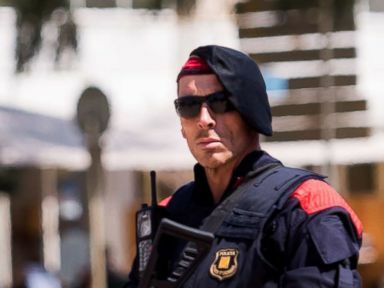 A State Department official told ABC News another American citizen was injured in Spain. "The U.S. Consulate General in Barcelona continues to work with local authorities to identify and provide assistance to U.S. citizens affected by the terrorist attacks in Las Ramblas and Cambril. At this time, we can confirm that one U.S. citizen was killed," the official said in a statement Friday. "We also can confirm that another U.S. citizen sustained a minor injury. Spanish authorities report that there are still several casualties who are not yet identified. Out of respect for the families’ privacy in their time of grief, we have no further comment." According to a preliminary assessment by Spanish authorities, those injured and killed in the attacks represented at least 34 different nationalities. Spanish Prime Minister Mariano Rajoy on Thursday expressed solidarity with the victims and their families, describing the attack in Barcelona as "jihadist terrorism." Those responsible for the rampage will be brought to justice, he said, stressing that the response to terrorism must be global. Rajoy said Barcelona residents are suffering "the same pain and the same uncertainty" as their neighbors in Madrid, Paris, Nice, Brussels and London, referencing other European cities that have also been subject to deadly terror attacks. ABC News' Erin Dooley, Caroly Durand, Ayanna Gill and Allie Marzella contributed to this report.